Apple, has introduced Powerbeats Pro, wireless earphones that provide a “deep integration” between Beats and Apple engineering. According to Luke Wood, president of Beats, the earphones boast an upgraded linear piston driver that leverages an efficient, pressurized airflow to create a powerful acoustic response in a small package. To achieve the best possible fit on the widest array of ears, over 20 configurations were electronically modeled and physically tested, he adds. It comes with four sizes of ear tips and a redesigned, adjustable earhook. Powerbeats Pro is 23% smaller than its predecessor and 17% lighter. The lightweight design is also sweat- and water-resistant. Powerbeats Pro can handle phone calls. A first for Beats, a speech-detecting accelerometer in each earbud and two beam-forming microphones per side target your voice and filter out external sounds such as wind and ambient noise. Each earbud has up to nine hours of listening time and more than 24 hours of combined playback with the magnetic closure case. With “Fast Fuel,” you get 1.5 hours of playback after just five minutes of charging and up to 4.5 hours after 15 minutes of charging. 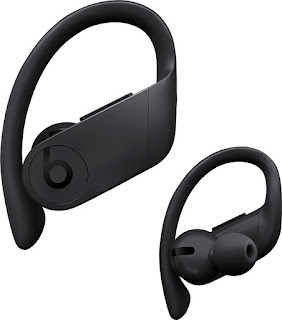 Powerbeats Pro earphones, compatible with both iOS and Android devices, power on when taken out of the case and power off (and charge) when placed inside. Motion accelerometers detect when the earphones are idle and not in use, automatically entering them into sleep mode. Each earbud independently connects to your device via Bluetooth, so you can choose to use one or both. Pairing is done via the Powerbeats Pro case—simply opening the lid for the first time prompts pairing mode. Powerbeats Pro is automatically paired with any of your supported devices that are signed in to your iCloud account. You can simply say “Hey Siri” for voice-activated assistance without having to reach for your iPhone. The Powerbeats Pro is powered by the new Apple H1 chip, which is also in the latest AirPods. Powerbeats Pro will come in black, ivory, moss, and navy for $249.95 Availability will begin in May from apple.com and Apple Stores in the US and more than 20 additional countries and regions, including Australia, Austria, Belgium, Canada, Denmark, Finland, France, Germany, Greece, Hong Kong, Ireland, Italy, Japan, Lichtenstein, Luxembourg, Macau, Netherlands, New Zealand, Norway, Portugal, Puerto Rico, Singapore, Spain, Sweden, Switzerland and the UK. Additional countries and regions coming later this summer/fall.